An idyllic hideaway for families with children, Mercure Pattaya Ocean Resort is a great value leisure resort moments from the beach. 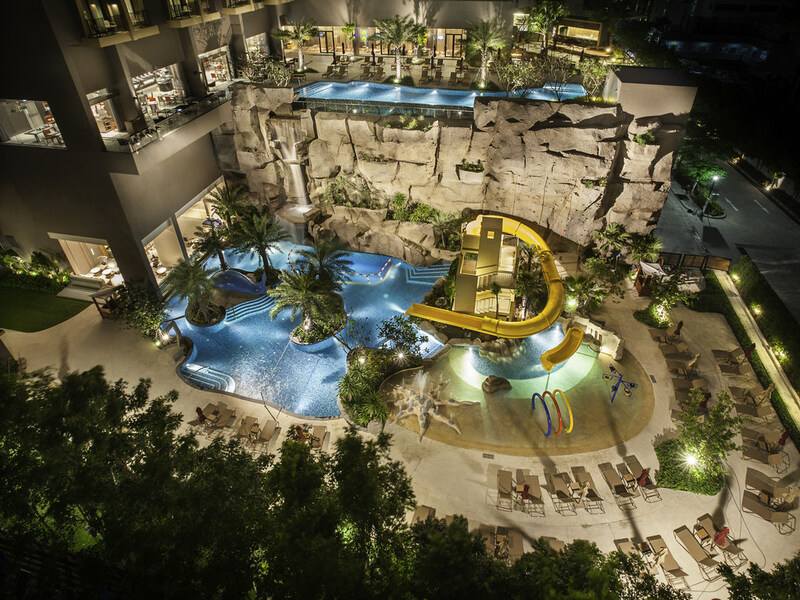 A highlight is its mini water park with a rock wall and caves, two swimming pools, and slider for family fun. Stylish and comfortable guestrooms include free WIFI. At the restaurant guests can enjoy international cuisines and local flavours. With a choice of venues, the resort is perfect for business meetings, events and incentive travelers. Pattaya highlights include Pattaya Beach, Art in Paradise, Terminal 21 Pattaya, Central Festival Pattaya, the largest beachfront shopping complex in Asia, and the Tiffany transvestite cabaret show. Ocean resort with mini water park themed, mini rock climbing wall and caves. Unwind with friends and family or meet up with business colleagues at the hotel bar, which has a wide selection of delectable drinks and tasty light bites. First time I turned disappointed from my vacations. I have been member with Accor for quite long, but always enjoyed my stay. This turned out to be my worst experience and would not recommend anyone travelling to Pattaya. I was getting Hilton for almost same range but I regret opting Mercure. Poor infrastructure and services was the reason. Brilliant hotel, everything you could wish for! Loved this hotel, from the friendly door staff through to the reception staff. The room is spotlessly clean with free drinks, which is a great bonus. The pool area is a delight. Thank you to all the staff and look forward to seeing you again. My daughter's necklace is missing. I think we forget the necklace in the room. and call to reception after 2 day check-out but they don't find it. Comfortable. The room is clean and very good view. All staff are always smile. Security guard (in thai is รปภ) are take care very good. This hotel is severely lacking. The hotel is understaffed and the staff is undertrained. This is the only hotel I have been in Thailand where staff looks down at their computers or the floor when they see you. There isn't that friendly thai welcome that you experience at other hotels. Good facility and Best service. I really disappointed with room hotel, it's very small, look like budget hotel moreover ocean park pools is suitable for children that it's not same in website. Hotel is on a great location that allows you to have peaceful rest but at a walking distance to the beach and shopping mall. Accommodation is nice and fully furnished but no bathtub for all type of room. Water park is always a place where the kids would spend the time there at all time. check in was took much time around 30mins.should be improved the process. room is not clean i found many hairs on the floor that was shocked. Breakfast is very well and the pool is really fun. We enjoy our stay very much. It was nice, our son love the water park. Location of the hotel is great. The staffs were very nice and helpful. Welcome Reception/ pre-registration / pre-check-in are very good. Room is good, but expect more per Accor Standard. Breakfast - variety, but material are consider as Fair. But service to re-fill the food was not quick enough. You can forecast the traffic for weekend breakfast, but seem your FB manager failed on this one. Room and bed condition were acceptable , TV was in analog age and should be urgently modernized. Breakfast was generally OK but not enough for something , the dinning room was clowdy and disordered. Lacking of food service and long waiting queue but the food taste was not bad. The pool was already over capacity with strong chlorine smell which may not good for health. Good taste of welcome drinks especially for the smoothy. Good car park building but the space was too narrow. I parked may car on the top floor without the lighting at night.